Lake Lewisville is one of the largest lakes in North Texas, spanning 29,000 acres with more than 230 miles of shoreline. The lake is great for fishing, skiing, swimming or just relaxing. There are numerous parks, campgrounds, hiking/biking trails and golf courses around the lake. Cottonwood Creek Marina is located on the northeast side of the lake, in the growing town of Little Elm. From the Dallas Nautical Boat Club marina to your favorite restaurant, fishing spot, or cove you’re just minutes away. 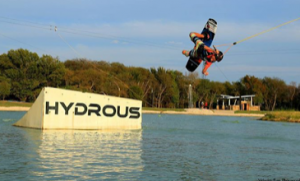 Hydrous Wakepark has become a go-to spot for wakeboarders all around North Texas. The 10-acre cable park and adjacent beginner training area are perfect for families looking to enjoy the wakeboard experience. When the day is over, stick around and enjoy food, drinks and music at the Towers Tap House, which is adjacent to the park. 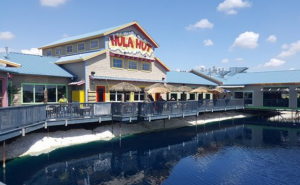 A traditional Tex-Mex restaurant with a Polynesian twist, Hula Hut serves up the finest in “Mexonesian” cuisine along with lots of fun and music at any of the three bars. The restaurant is decked out with tiki torches, bamboo walls, grass-thatched roofs and thousands of colored lights. And remember, it’s always Island Time at the Hula Hut! Sneaky Pete’s has been serving up burgers and beer to boaters and Party Covers since 1989. 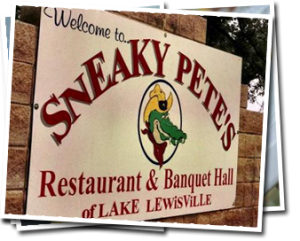 A favorite with the young and ageless, Sneaky Pete’s is famed for their four bars, sand volleyball courts, giant pool deck and carefree attitude. Oh, and there’s the lake out back! 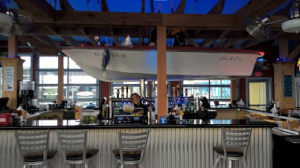 Rockin’ S Bar & Grill is a year-round attraction at Pier 121 Marina. With live music weekly, TVs in every corner, amazing food and an online jukebox, it is the perfect place to enjoy a lakeside meal.